Is the window closing on the Israeli-Palestinian peace process? Probably. But in case you were wondering, you’re not alone. A Google search on "window closing peace Israel" produces 17.5 million hits. The window for this metaphor might not have closed, but it’s on the brink like Jordan (5.8 million hits). The window was only closing on the peace process 57,000 times in 2004, but by 2007 271,000 creative souls were closing the curtains. 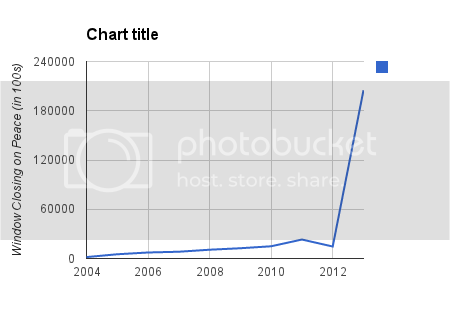 617,000 hits the next year, and then the remarkably resilient window broke the 1 million mark for the first time in 2011. But then a puzzling fall in 2012 to a mere 620,000 pages mentioning a closing window for the peace process clearly presented an irresistably open window and headline writers leapt through: In only two and a half months of 2013 we’ve already got 1.27 million references! Yikes! 20.5 million hits in just over two months (and yes, that’s more than the 17.5 million total from the "any time" search — welcome to Google Math.) Take out that spike, and the second chart looks a lot like the first — steadily rising use of the window metaphor over a decade followed by an unexplained drop in 2012 and then a big jump this year. What does that mean in the real world? 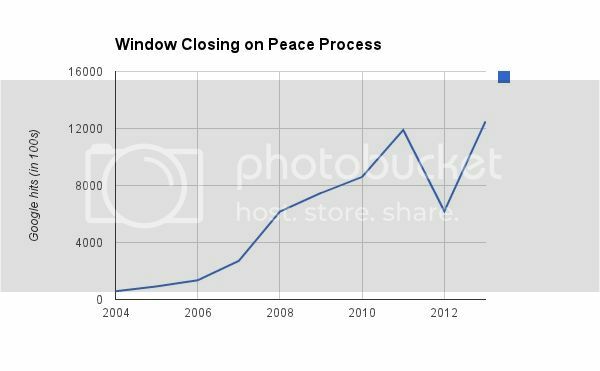 Nothing much, other than that the window for peace is probably closing but the window for window closing metaphors never will. Anyway, this is more fun than grading papers. OK, editors, this one’s free: Once again the peace process is on the brink of a closing window because of a shameful failure of bold leadership. Will the world’s headline writers muddle through? Only time will tell.